Exhibition at the Southbank Centre, London. August 2012. 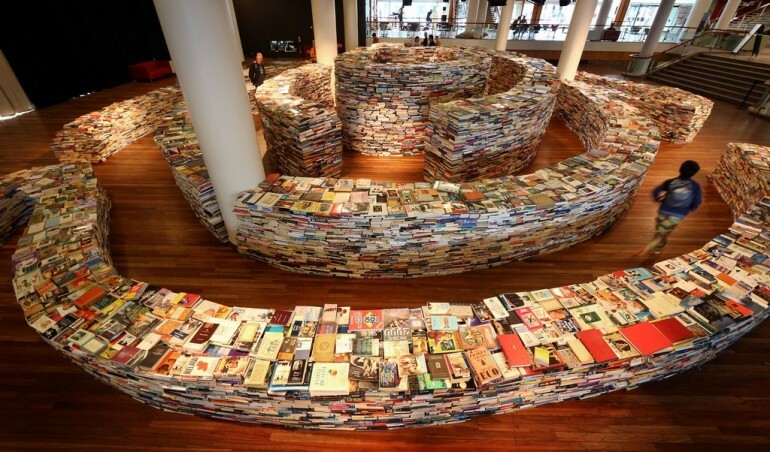 This maze of 250,000 books has been installed on The Clore Ballroom in the Royal Festival Hall in London. Oxfam loaned 150,000 of them. When the exhibition is taken down, the books will be returned to Oxfam along with the other 100,000 donated by UK publishers. The books will go to Oxfam’s used books stores to raise funds for Oxfam projects. Inspired by the stories of Jorge Luis Borges, the maze was created by Brazilian artists Marcos Saboya and Gualter Pupo, in collaboration with production company HungryMan. Hear more here. See more here. Thanks to Michael Lieberman at Book Patrol for drawing this pile of books on books to our attention.